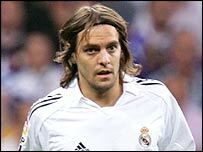 Jonathan Woodgate is keen to prove his fitness to new Real Madrid boss Fabio Capello in pre-season training. Injury problems have restricted the 26-year-old to only 14 appearances in two years at Real but, after training at old club Leeds, he is raring to go. "I can't wait for 12 July to arrive so I can run with the others and work hard to show those who doubt me I'm ready for the new season," said the defender. "Nothing would make me happier than to wear the white shirt at the Bernabeu." Woodgate missed the whole of his first season at the club because of injury before finally making his debut in September 2005 - scoring an own goal and being sent off. Since then he has had two more injury lay-offs, raising questions over whether he has a future at the club. But Woodgate, whose last appearance was in February's Champions League defeat by Arsenal, said this was news to him. "No-one has been in touch to say they don't want me, so it's all someone's invention," he added. He is also eager to savour the training methods of new coach Capello. Woodgate stated: "I love physical effort and I've been told Capello will be really demanding from the first day. Great!"